Many of us take drinking clean, safe water for granted – until we head out on a camping trip or multi day hike. It’s then that we realize that carrying enough drinking water for several days is just not realistic – and drinking untreated water is just too risky. Luckily, there are many affordable portable water filters that we can use to safely filter water. 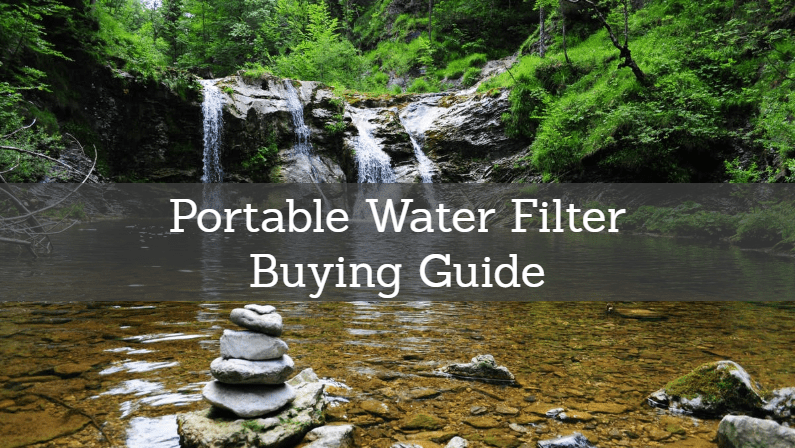 This guide will explore all the options and help you find the best portable water filter for your needs and budget! The Katadyn Vario Dual Technology MicroFilter is our pick for the best portable water filter in the luxury category. The advanced filter can handle a high flow, filtering up to 2 quarts per minute. The whole unit weighs only 15oz, and is small enough to take anywhere – even on extended backpacking trips. You can attach the unit directly to a water bottle, or use the hose to fill pots and pans. The unit features a glass fiber filter and an activated carbon filter. You can also have the option of using a ceramic pre-filter if the water source is particularly dirty. This prefilter will slow down the flow rate, but it will keep the internal filters cleaner and help them last longer. 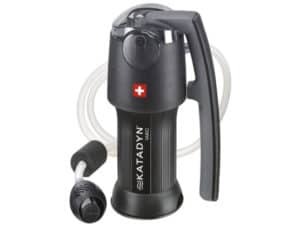 The Katadyn earns great ratings in portable water filter reviews. Despite the advanced technology, the unit is still quite affordable. Click here to learn more. 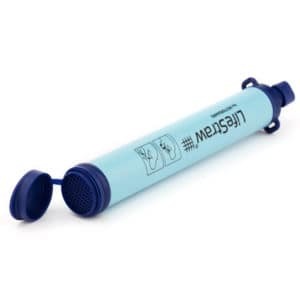 The LifeStraw is an ultra-lightweight portable water filtration system built into a 2-oz “straw” design. It basically allows you to drink directly out of a lake, stream, river, etc. Alternatively, you can fill a water bottle with water from the stream, and use the LifeStraw to drink from the bottle. It’s a best-seller, and consistently earns great ratings in portable water filter reviews. The lightweight design and ease of use make the LifeStraw a top choice for backpackers and adventure junkies that want a small setup. It takes up virtually no room, and only adds 2oz of weight to your pack. It’s also extremely affordable, and lasts for a long time. Its filtration technology meets US EPA standards for drinking water, and safely removes bacteria, protozoa and microplastics. Of course, the design of this unit has some limitations. It can only be used as a straw, so you can’t use it to fill a container with clean water. This also makes it unfit for group use – although with the low price point, everyone could just carry their own LifeStraw! Click here to learn more about the LifeStraw! 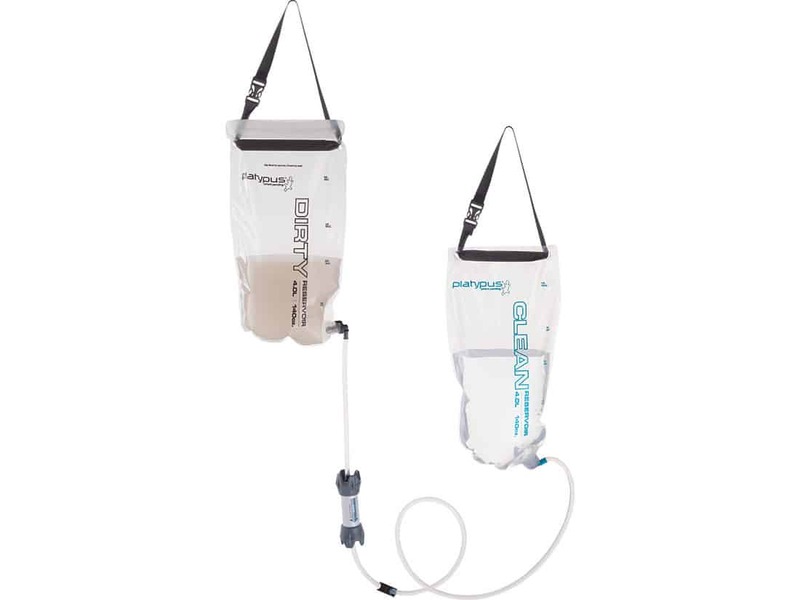 The Platypus GravityWorks 4L is a gravity filter that effectively removes up to 99.9999% of bacteria and 99.9% of protozoa including giardia, E. coli, salmonella and more. It’s NSF/EPA certified for the removal of these dangerous contaminants. It uses the power of gravity to push water through the filter, so no pumping is required. Simply fill up the bag, and hang the unit in a nearby tree while it filters. The entire kit weighs just 11.5 oz, and folds down into a very small carry bag. Despite the small size, it can filter 4 liters of water in just 2.5 minutes. That’s enough water for drinking, cooking and cleaning – all in one filter run! Plus, this unit is easy to use – no pumping, twisting, sucking or work required! Pump-Style Water Filters – require manual pumping, with a hose running to the water source and another to the water container. Many pumps can be attached to your water bottle. Straw-Style Water Filters – require sucking through the straw, directly from contaminated water sources (or from a water bottle). Only good for one person. Gravity-Style Water Filters – uses gravity to push water through filter system into secondary (clean) water container. Good for groups. In the end, all these types of filters can work well – it just depends on what you would prefer and what is best for your situation. The importance of drinking safe, clean water cannot be overstated. At home, many of us take clean water for granted. But when we’re out in nature or traveling the world, things change – and we can’t necessarily trust the water we’re drinking. Water from rivers and streams in the wilderness may look clean, but there’s a good chance it could be contaminated with viruses, bacteria, parasites and other contaminants. There are lots of potential contaminants, but some of the most worrying are giardia, shigella, and norovirus. At best, drinking contaminated water may result in an upset stomach. At worst, it can cause extreme diarrhea (often leading to dehydration), or even hospitalization in some cases. Bottom line – drinking untreated water is simply not worth the risk. Using a good portable filter is a great way to significantly reduce the odds of complications. Size/Weight: Since portability was obviously important, we closely considered the size and weight of each unit. Of course, there’s only so much filtration you can get from the ultra-small units, so we also included some midsized units that were perhaps more effective, at the cost of being a bit bulkier. Filtration Technology: There are lots of different levels of water filtration – particularly when it comes to portable filters. We looked at units that used advanced water filtration technology to remove the largest percentage of contaminants possible. Reviews: Our own research and testing was the most important, but we also analyzed many third-party portable water filter reviews. This helped to round out our own data and gave us a broader view of what consumers experienced with each product. Value: Portable filters are usually fairly affordable – but we definitely still considered the value offered by each model. Beyond initial cost, we looked at how long the filter was designed to last, and looked for data on durability in customer reviews.